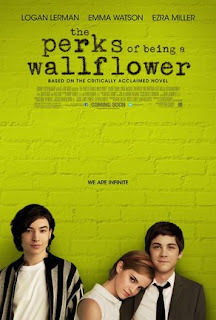 The perks of being a wallflower, which means the benefits of being a loner or shy. Wallflower means the shy people. I watched this film last night. The story is about a boy named Charlie and his friends and family. Charlie is a shy boy and an intellectual, who has just entered into high school, at first he find himself lonely, but at the first day of school he makes friendship with Mr. Anderson, his englirh teacher. Charlie wants to be a writer, as he is a quite person, he could not tell about his pain, feeling and fantasis to other people. Charlie have a elder brother, who is in college and plays bowl and a sister who has a boyfriend who gives her a mixed tape every week. Charlie was alone after his best friend shot himself, but he makes friends with Patrik and his step sister Sam. Patrik loves football and he is funny all the time. In their group there is a punk buddhist girl named Mary Elizabeth, and Brad who is a little paranoid and Lenny who wants to be in film school. Charlie fell in love with Sam, but Sam she loves someone else. Meanwhile, Mary Elizabeth asks Charlie, Charlie gets surprised and she tells him that Charlie is a cute boy. Charlie didn't want to break her heart, so he dates her twice, but eventually, in a truth or dare game,Charlie tells the truth that his relationship with Mary is not working, but nobody believes him, so Patrik dared him to kiss the prettiest girl in that room ! And Charlie kisses Sam, so everything get messed up for a while, but after two months, when Patrik gets in a fight, Charlie saves him. And again they becomes friends. Charlie is epileptic, he worry too much about the people. He worries about the pain of the other people. As Sam and Patrik was senior to Charlie, they gets graduated. And Charlie counts that he still have 1095 days in high school. Before leaving to college, Charlie helps Sam to pack her things, and Sam asks Charlie, why did he never asked her out ? Charlie said that he only wanted her to be happy. Sam tells him that she doesn't want to be a crush of someone, she wants to be loved. Then Charlie kiss Sam. Sam and Patrik leaves next day, and Charlie gets lonely again and he gets epileptic and in medical doctor tells him that we can not choose where we come from but we can choose to go anywhere from here. After two month Sam and Patrik comes home and they go to a drive through the tunnels, and Sam knew in his heart that everything is going to fine. He knew that he was okay. At that moment he was thinking only about that moment. Patrik was driving and Charlie stands back in the truk, he was looking at her, the song Heroes was on, Charlie is no longer going to be loner, he found his friends, he found his love. These moments may pass, but still these moment can last to infinite. He is no longer choose to be alone, he has chosen the love he deserves, he now feels infinite Joy. That is the story of Perks of being a Wallflower. The color, lights are very beautiful. The characters are defined very well, it is good know the backgrounds of the characters. Above all this film can relate to many young and young adults.